Where do you get the best beer in London? Join us for our West End Beer Tasting Pub Tour and find out! Get introduced to the best pubs in London. The tour includes 6 samples of beer. London has over 700 pubs, but which ones should you visit? Let our local guide show you the hidden gems of London's world famous West End area and show you the best local pubs bursting with character and charm. We encourage our guests to generously sample and discuss some of the best beer sold in the capital (included in the price of the tour!). This tour is a great option for before dinner or catching a show. 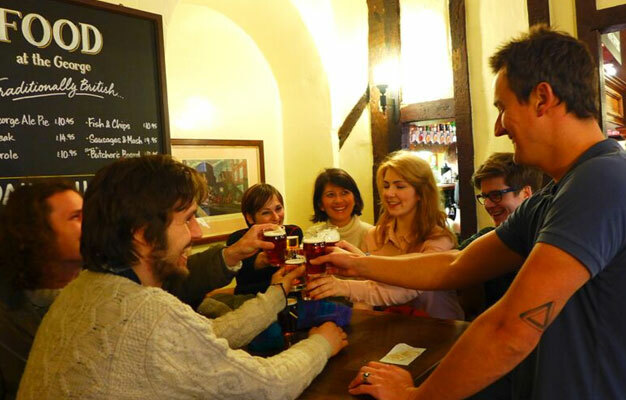 After your tour you'll have a native Londoner's knowledge of the off-the-beaten-track historical pubs that are London's social heart, not to mention a great grounding in what makes European and British beer the best in the world. The tour includes highlights such as: Trafalgar Square, Covent Garden, London's world famous theatre district, four excellent establishments and six beer tastings. As well as including a generous supply of beer you also get some tasty snacks along the way to make sure you get the most out of your tour. The tour starts on the north side of the front entrance to St Martin-in-the-fields Church where you will see your guide holding a Fat Tire sign. No. You must be 18 years and older to participate in this tour. Yes. Please bring photo ID with you. The tour departs Wednesday, Friday and Sunday at 2 PM.